This is a very sweet romance story. 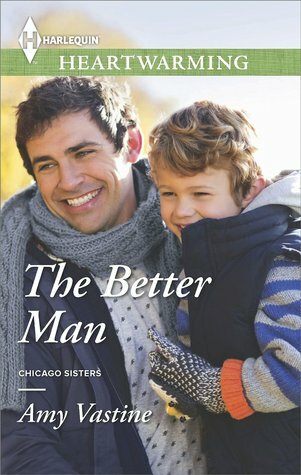 Max moves to Chicago to try and form a relationship. Then Kendall and her son run into Max and her son finally starts to open up. What is Kendall supposed to do but allow Max and her Son to be around each other. Her son is finally opening up and talking again. But Max also has his ex wife and 3yr old son to deal with. It was a very sweet and clean romance. This is the closest to a real life relationship that I have read about. A good read! “I’m coming over tomorrow and helping Mom throw away all your junk food. We’re putting you on a diet.” “What?” He looked at his wife for confirmation. “Says the girl licking fake powdered cheese off her fingers,” Lucy said with a sneer. Kendall let them all fight it out. Her mom explained she’d be packing her dad’s lunches from now on, which sent him into a tizzy. Emma and Lucy continued to exchange gibes. Even as they roared, Kendall smiled. They were a loud and obnoxious bunch. They might not agree on everything, but they loved one another and she loved them. Spurs & Lace is free! Start this series today! Release Day Blitz for A Good Girl! Risking it All Release Day Blitz! Now is our Time Promo! The Dybbuks Mirror Release Day!! Chronicles of Steele Raven Episode 2 Free! $200 September Blogger Appreciation Giveaway! Bad Boys of Romance Release Day! Love Discovered in New York Release Launch!